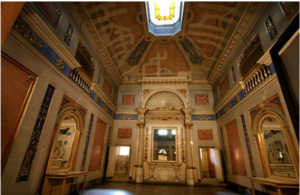 LET’S UNVEIL THE HISTORY OF THE SYNAGOGUE OF CARPI !! The Synagogue of Carpi was built in 1772 and is called ‘the old synagogue’. It is on Via Rovighi, which used to be the Jewish ghetto. In 1907 it was closed because of a drop in the Jewish population of Carpi, but was restored in 2009. Nowadays, the synagogue is not used for religious purposes, but for shows and conferences. Palazzo Pio is an impressive building and a symbol of the architecture of the Renaissance. It is situated between Piazza Martiri and Piazzale Re Astolfo.